Executive Office Furniture with cone shaped legs DELUXE is the result of a fusion between aesthetic, functionality and materials. 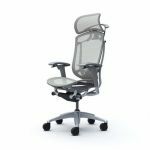 Dynamic and essential design, wood finishes and glass matched to the original and exclusive cone shaped leg, create a manager high professional image profile who prefers functionality to status symbol. 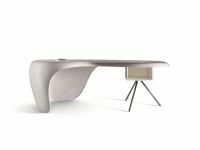 Metallic base is made out of conic shaped and curved legs provided with adjustable feet. Basement is available in chromed and epossidic paint aluminium, gloss black, white varnishes. The upper part is characterised by a solid hook through metallic beam which gives stability to the whole structure.